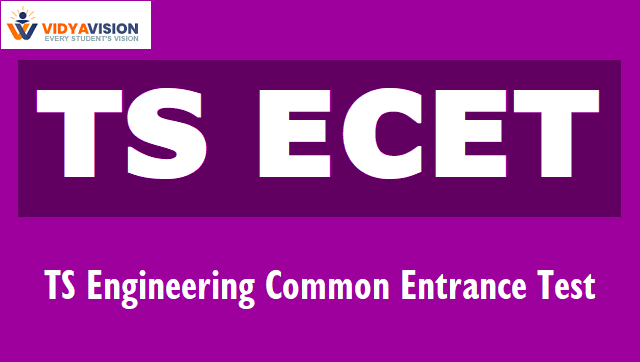 TS ECET 2019 Telangana State Engineering Common Entrance Test is an entrance exam conducted by Jawaharlal Nehru Technological University, Hyderabad on behalf of the Telangana State Council of Higher Education for the academic year 2019 for Diploma Holders Engineering/Technology/Pharmacy and for B.Sc (Mathematics) Degree Holders. (i) For lateral admission into 2nd year regular B.E. / B.Tech. Courses in both University and Unaided Private Professional Institutions (Minority & Non-Minority) approved by All India Council for Technical Education. TS ECET 2019 Application Form has been released on 6th March 2019. The last date to submit the application form without late fee is 8th April 2019 TS ECET 2019 Examination will be conducted on 11th May 2019. 2) Candidates should belong to the state of Telangana/Andhra Pradesh. 4) Candidates who obtained a Diploma in Engineering/Technology/ Pharmacy or any other equivalent Diploma from the State Board or recognized by the Government of Telangana/ Andhra Pradesh are eligible for admission into the relevant B.E/ B.Tech./B.Pharm courses corresponding to their diplomas. 5) Candidates who passed the 3-year B.Sc Degree examination with Mathematics as one of the subjects in the group combination or its equivalent from a recognized University in the Telangana/Andhra Pradesh state are eligible for entry into relevant courses. 6) Candidates should have passed Diploma in Engineering/Technology/ Pharmacy/ B.Sc (Mathematics) Degree with at least 45% marks (40% for SC/ST) for entry into relevant courses. 7) Candidates who are pursuing a Diploma course shall be eligible for entry into the relevant courses only if they have completed diploma course before time of admission into the college. 2) TS Online / AP Online Centers / Mee Seva centres / e-seva centers in Telangana/A.P. Note: List of Centres will be given in Official Website State and District-wise. i) Recent passport size digital color photograph (file size <50 KB and .jpg/.jpeg file format) of candidate for uploading. ii) Digital Signature of the candidate (file size <30 KB and .jpg/.jpeg file format) of candidate for uploading. iii) Exam Centre to which candidate wishes to appear the examination. iv) Mobile Number of the candidate. v) E- Mail of the candidate. vi) Place where Studied Diploma/Graduation - Municipality/Corporation/Rural. The candidate is required to take printout of filled Application Form and it is to be submitted to the Invigilator during the examination after affixing a recent color photograph duly attested by the Gazetted Officer or Principal of the College where studied qualifying examination. 1) The exam is for 3 Hours of duration from 2:00 PM to 5:00 PM. 2) The examination will be conducted in Online Mode: Computer Based Test. 4) All questions are of objective type only and each question carries 1 mark. 5) The question paper contains questions in English only. 6) Total marks: 200 marks. Detailed Syllabus of each test paper will be given at the TS ECET official website on the release of official notification. Hall tickets will be available from 1st week of May 2019 in the TS ECET 2019 official website. Hall tickets will contain information like candidate’s name, roll number, exam date, time and venue details. Candidate has to download the hall ticket from TS ECET 2019 official website. Hall ticket will NOT be sent in post or mail to the candidate. The qualifying percentage of marks is 25% of the maximum marks. For SC/ST candidates, no minimum qualifying mark is prescribed. But their admission will be limited to the extent of seats reserved for such categories. The TS ECET 2019 results will release on 4th week of May 2019 through official portal. Candidates can check and download the results and rank card from TS ECET official website. Rank card will NOT be sent in post or mail to the candidate. 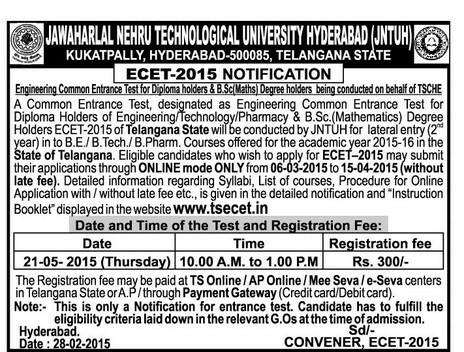 1) The Candidates, who wish to apply for TS ECET, must apply through online only. 2) It is advised to visit your allotted Examination Centre well before so that you can take examination tension-free. 3) Candidates are not admitted to the examination after 10.00 A.M. and not permitted to leave the hall before 1.00 P.M.
4) It is the responsibility of the candidates to ensure that they are answering the correct Question Booklet of the branch for which they are eligible for admission. 5) Candidates must return both Questions Paper Booklet Acknowledgement slip and OMR Answer Sheet after the test. 6) The Question booklet code, Hall Ticket Number and other details must be entered correctly and properly on the OMR Answer Sheet, in the Test. Otherwise ranks declared, if any will be cancelled subsequently in such cases. 7) Question paper will be in English only. 8) Affix a recent color photograph (3.5cms x 3.5cms) in the box provided (Bottom – Left side) on the “FILLED IN ONLINE APPLICATION FORM and get it attested by a Gazetted Officer / Principal of the college where studied. 9) The candidate has to submit the “FILLED IN ONLINE APPLICATION FORM” to the Invigilator in the Examination Hall on the day of the exam.